This pattern is my tribute to the men of Boulder, Colorado. Boulder is home to the University of Colorado, high-tech businesses, and some of the best rock climbing in the world. 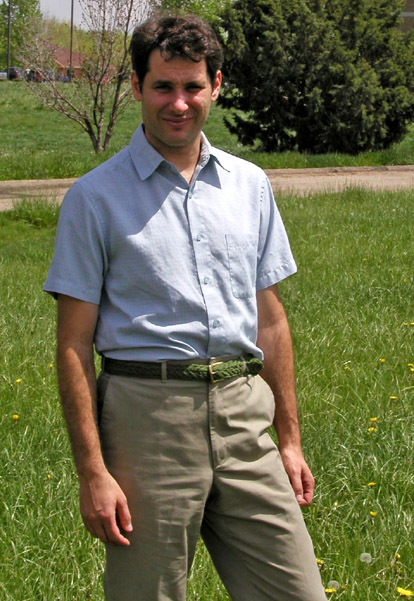 The men here are highly educated, athletic, casual but stylish, and living in the beautiful Rocky Mountains, many of them care deeply about animals and the environment. A great many Boulder men are vegetarians, and this puts them in a bind. I've heard them lament about the trials of trying to dress well while living by their values. For a man who would no more wear a dead animal than eat one, it is very difficult to find a stylish belt. Most have had to settle for an army surplus webbing-and-D-ring belt that doesn't suit their sense of style, or a vinyl imitation-leather belt that feels sticky and still looks like the animal skins they are trying not to wear. I'm hoping my creation will fill a void for animal lovers everywhere, giving men an option that is casually stylish, masculine, and a statement that is nothing like an ordinary leather belt. 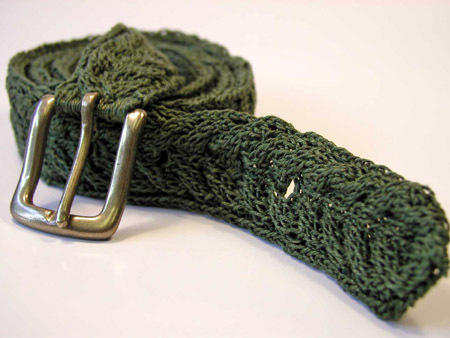 To give a knitted item the firm body that a belt requires, I've chosen durable hemp yarn and knitted it with needles two sizes smaller than the label suggests. The aran-style cable pattern gives the belt more structure, as well as a classically masculine look. If you'd like to substitute yarns, linen gives a similar tough, firm feel; lace-weight cotton or wool will produce a softer belt. I salvaged my belt buckle from an ugly, inexpensive belt from a thrift shop. You can also find buckles at most fabric stores. I've written the pattern for a belt with holes -- if the buckle has a center prong -- or without, for prongless buckles. Lanaknits Allhemp3 [100% hemp; 150 yd/137 m per 40g skein]; color: Avocado 10; 1[2, 2, 2] skeins. Available at www.lanaknits.com if you can't find it at your LYS. Note: Size S uses exactly one skein, with very little left over. A second skein may be desired. Rounds 1, 2, and 3: P2, k13, p2, k11. Round 4: P2, sl3 to cable needle and hold to back of work, k3, k3 from cable needle, k1, sl3 to cable needle and hold to front of work, k3, k3 from cable needle, p2, k11. Round 1: P2, k13, p2, k11. Round 2: P2, k6, reach left needle behind work and pick up center st of stockinette section (this is sixth stockinette st, the last st on second double-pointed needle), k this st tog with next st on left needle, k next st and pass previous st over, k5, p2, k5, bring yarn over right needle to front of work then between needles to back of work, k5. This joins the front of the belt to the back of the belt at the buckle hole (and makes the hole). Round 3: P2, k6, k1 into loop on second needle (do not drop loop from second needle), k6, p2, k5, k again into loop, k5. Leaving an 18-inch tail, CO 28 sts. Divide sts on needles as follows: 17 sts on first needle, 6 sts on second needle, 5 sts on third needle. Join to begin working in the round, being careful not to twist. If desired, use safety pin to mark beg of round. Work in Wheat Ear Cable Pattern. If using a buckle with no center prong, cont until work measures 38[43.5, 49, 54.5, 60] inches, then cont to "Belt Tip". If using a buckle with a center prong, cont until work measures 32[37.5, 43, 48.5, 54] inches, ending with Round 4 of cable pattern. *Work 4 rounds of Buckle Hole Cable Pattern once. Work 4 rounds of Wheat Ear Cable Pattern once. Repeat from * 4 times more. Cont in Wheat Ear Cable Pattern until work measures 38[43.5, 49, 54.5, 60] inches. Round 1: P2tog, k2, sl1, k1, psso, k5, k2tog, k2, p2tog, sl1, k1, psso, k7, k2tog. Round 2: Sl1, k1, psso, k1, sl1, k1, psso, k3, k2tog, k1, k2tog, sl1, k1, psso, k5, k2tog. Round 3: Sl1, k1, psso, k1, sl1, k2tog, psso, k1, k2tog, sl1, k1, psso, k3, k2tog. Round 4: [Sl1, k1, psso, k1, k2tog] twice. Round 5: [Sl1, k2tog, psso] twice. 2 sts rem. Pass first st over second st. Break yarn, leaving a 6-inch tail, pull tail through last st.
Weave in ends securely by weaving back and forth a couple of times to secure, then inserting needle down into tube formed by belt for a couple of inches. Pull the threaded needle tightly so the belt scrunches up a bit, cut yarn, and pull belt straight. Set an iron to "Cotton/Linen" setting with steam. Before pressing, the belt will be cylindrical, like a snake. Use your fingers to flatten out a small section of the belt so that the cable pattern appears on top, with one stitch of the stockinette backing along each edge (see photos). Holding the section flat, but keeping your fingers away from the section to be pressed, cover with a press cloth, and press with steam. Repeat, section by section, until the entire belt is pressed flat. Allow belt to cool before sewing on the buckle. Sew buckle securely to CO end of belt. Weave in rem end. Your Boulder Belt is complete! Anita Harkess lives just outside of Boulder, Colorado, where she knits, writes, edits, and admires the men. A compulsive knitter since the age of ten, Anita was once cast in a play just because she could knit gloves without looking down at her work.